a “floppy” doesn’t merely describe your best sun hat! 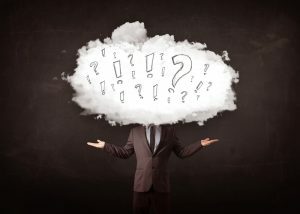 Perhaps now you’ve heard the latest “techy” phrase “the Cloud” and you’re wondering: What is this “Cloud” anyway? Basically, the Cloud is the Internet. The Internet hosts certain software packages that users can access anywhere via an Internet connection, as apposed to installing software directly on their personal computer. In fact, there are Cloud-based products on the market now to do your bookkeeping, such as QuickBooks Online, Wave and FreshBooks, to name a few. These products boast of their accessibility, drastic simplification and user-friendliness. While we don’t necessarily disagree, we would like to offer a word of caution to business owners. Would you trust someone without a valid driver’s license to drive you to Florida just because your car had an automatic transmission, was self-parking, and had hands-free phone access? A ridiculous concept indeed! However, as accountants, we’ve seen many business owners doing something quite similar. They’re putting too much trust in the automated “ease of use” claims of the Cloud-based software companies, reasoning that they no longer need an experienced bookkeeper “at the wheel”. Many times, the individual preparing the books has no prior bookkeeping experience. This is a bad idea and leads to very messy bookkeeping – garbage in, garbage out. A frequent feature for these Cloud-based bookkeeping packages is the ability to upload your bank activity right from your bank account into the bookkeeping software. This is a beneficial feature for sure. But if not set up properly from the start, each time the bank transactions get uploaded, the books get worse. For example, it’s tricky getting the income and expense accounts set up for bank transactions. If done wrong, your books quickly become unusable for your accountant. In most cases, we find that before any year-end work can begin, the books must get fixed first. In fact, there have been several instances where fixing a client’s books has taken considerably longer than the time it takes to prepare their year-end financial statements and tax returns. Therefore, we urge you, when it comes to bookkeeping – use the cloud, but don’t keep your head in the clouds! Please ensure you have responsible personnel at the wheel. Why not consult with us about your choice of bookkeepers or bookkeeping packages. We can help you make sense of it all and make informed decisions for your business.